September started with warm weather and this doesn't bother me at all.This is kind of typical weather for fall here,which is great!!! We still enjoy some of summer fruits and at the same time we welcome the autumn ones. 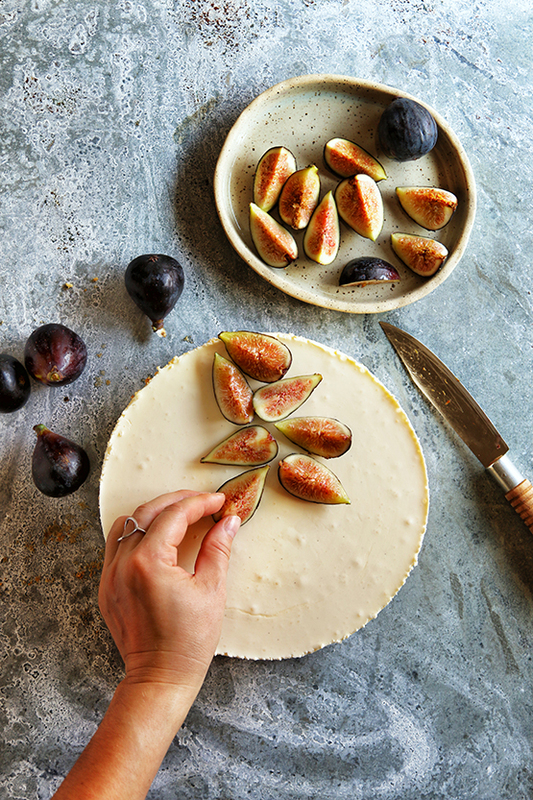 Figs are exactly those fruits which run late summer to fall and here in Portugal we have plenty of them. 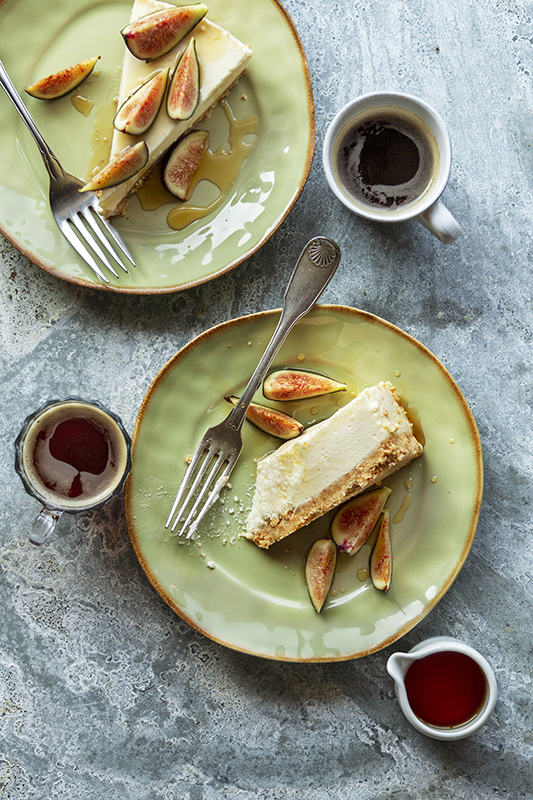 This no bake ricotta cheesecake has an airy and fluffy consistency similar to a mousse and it gets this texture from whipped cream and from eggs beaten over a pan with simmering water.Topped with fresh figs and drizzled with maple syrup is luscious. We enjoyed every bite! Grease and line with parchment paper a 9 inches (23cm) bottom of a springform pan. Place graham cookies in a food processor and blend until finely ground. Then,in a medium bowl,combine melted butter and graham crumbs. Make sure to get all the crumbs well coated then spread the crumb evenly over the bottom of the pan and press firmly to smooth.Chill until needed. Put the gelatine and 3 tablespoons of water into a small bowl.Stir to combine and set aside. 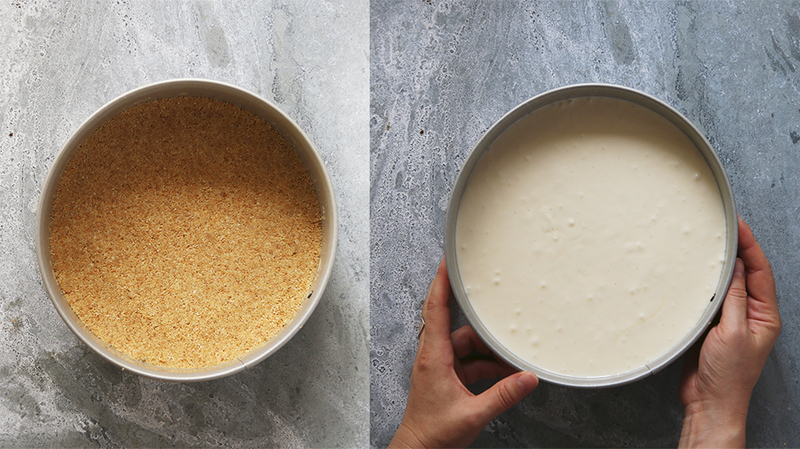 Place cheeses in a large bowl and beat with a mixer at medium speed until smooth and free of lumps,for about 2 minutes.Set aside. Then,place a medium bowl over a saucepan with simmering water but do not let the bottom of the bowl touch the water.Place the eggs in a bowl and with an electric mixer at high speed start to whisk adding the sugar gradually.Whisk until the mixture becomes thick, fluffy, and triples in volume,for about 4-5 minutes. After that, remove the bowl from the saucepan and set aside to cool slightly. Meanwhile,in another bowl,whip heavy cream until stiff peaks form. Add beaten eggs and whisk at slow speed until just combined. Pour 4 tablespoons of boilling water over soaked gelatine and place the bowl in a saucepan of barely simmering water, stirring until gelatine dissolves. Add gelatine and vanilla extract to the mixture and mix at low speed until well combined. Spread the filling over the prepared crust and gently rap the pan on counter to settle filling .Cover with foil and chill for at least 4 hours. After that time,run a knife around the sides of the pan to loosen the cheesecake. 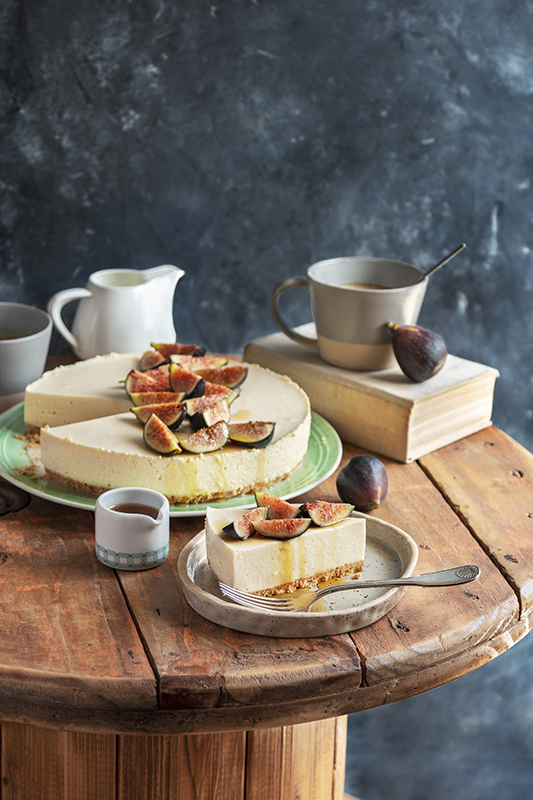 Serve topped with fresh figs and drizzled with maple syrup. oh yum!!! i love figs.